This paper aims to improve the understanding of transport processes in karst aquifers, which remains a great challenge due to its complex nature. A framework is proposed to identify and quantify the spatio-temporal variability of lateral exchanges along a karst conduit network during flood events, for both flow and solute transport. An inverse problem approach is used on discharge and water mineralization data sets and gives new insights into the hydrogeological behavior of such complex systems. 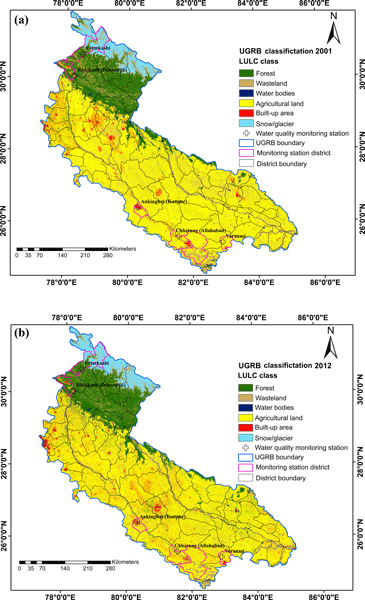 Geospatial technologies and OIP are promising tools to study the effect of demographic changes and LULC transformations on the spatiotemporal variations in the water quality (WQ) across a large river basin. Therefore, this study could help to assess and solve local and regional WQ-related problems over a river basin. It may help the policy makers and planners to understand the status of water pollution so that suitable strategies could be planned for sustainable development in a river basin. This paper sheds light on the integration of interdisciplinary knowledge in the assessment of flood vulnerability in Taquari-Antas river basin, Brazil. It shows how stakeholder participation is crucial for increasing not only the acceptance of model results but also its quality. Information on small reservoir storage is crucial for water management in a river basin. However, it is most of the time not freely available in remote, ungauged, or conflict-torn areas. We propose a novel approach using satellite imagery information only to quantitatively estimate storage variations in such inaccessible areas. We apply the method to southern Syria, where ground monitoring is impeded by the ongoing civil war, and validate it against in situ measurements in neighbouring Jordan. In view of the pressing need to assess the productivity of agricultural fields in Saudi Arabia, this study was undertaken in an attempt to apply the METRIC model with Landsat-8 imagery for the determination of spatial and temporal variability in ET aiming at optimizing the quantification of crop water requirement and the formulation of efficient irrigation schedules. This paper will be of great interest to readers in the areas of agriculture (in general), water management and remote sensing. 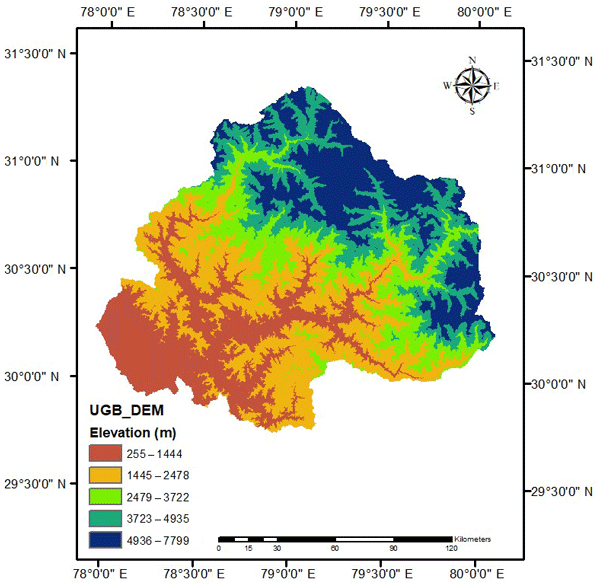 This paper aims at identifying Earth observation data sets that can help river basin managers detect drought conditions that may lead to impacts early enough to take mitigation actions. Six remote sensing products were assessed using two types of impact data as a benchmark: media records from a regional newspaper and crop yields. Precipitation, vegetation condition and evapotranspiration products showed the best results, offering early signs of impacts up to 6 months before the reported damages. The paper finds that combined inflow from both current and previous years' discharge determines water availability in downstream regions. Temperature determines broad vegetation distribution while hydrological variables show significant effects only in near-river-channel regions. Agricultural development curtailed further vegetation recovery in the studied area. Enhancing current water allocation schemes and regulating regional agricultural activities are required for future restoration. Yields of rainfed winter crops such as wheat can be substantially improved with limited supplemental irrigation. The upper Karkheh River basin in Iran has 15 840 km2 of rainfed crops. A GIS method was designed to identify suitable areas for irrigation and a routine was developed to allocate water uses and route the flows downstream. A maximum of 13 % of the rainfed cropland could be irrigated under normal flow, 9 % if environmental flow requirements are considered and 6 % under drought conditions. This paper describes a model inter-comparison and validation study conducted using sub-meter resolution thermal data from an aircraft. The model inter-comparison is between a physically based model and a very simple empirical model. The strengths and weaknesses of both modeling approaches for high-resolution mapping of water use in vineyards is described. The findings provide significant insight into the utility of complex versus simple models for precise water resources management. Adelinet, M., Fortin, J., d'Ozouville, N., and Violette, S.: The relationship between hydrodynamic properties and weathering of soils derived from volcanic rocks, Galapagos Islands (Ecuador), Environ. Geol., 56, 45–58, https://doi.org/10.1007/s00254-007-1138-3, 2008. AFNOR: Water quality – Protocol for the initial method performance assessment in a laboratory, La Plaine Saint-Denis, France, AFNOR, 2009. Arias-Estévez, M., López-Periago, E., Martínez-Carballo, E., Simal-Gándara, J., Mejuto, J.-C., and García-Río, L.: The mobility and degradation of pesticides in soils and the pollution of groundwater resources, Agric. Ecosyst. Environ., 123, 247–260, https://doi.org/10.1016/j.agee.2007.07.011, 2008. Arnaud, L., Charlier, J.-B., Ducreux, L., and Taïlamé, A.-L.: Groundwater quality assessment, Crisis Management of Chronic Pollution: Contaminated Soil and Human Health, CRC Press, Boca Raton, Florida, USA, 2017. Bexfield, L. M.: Decadal-Scale Changes of Pesticides in Ground Water of the United States, 1993–2003, J. Environ. Qual., 37, Supplement S-226–S-239, https://doi.org/10.2134/jeq2007.0054, 2008. Bocquene, G. and Franco, A.: Pesticide contamination of the coastline of Martinique, Mar. Pollut. Bull., 51, 612–619, 2005. Borsetti, A. P. and Roach, J. A. G.: Identification of kepone alteration products in soil and mullet, Bull. Environ. Contam. Toxicol., 20, 241–247, 1978. Brunet, D., Woignier, T., Lesueur-Jannoyer, M., Achard, R., Rangon, L., and Barthès, B. G.: Determination of soil content in chlordecone (organochlorine pesticide) using near infrared reflectance spectroscopy (NIRS), Environ. Pollut., 157, 3120–3125, https://doi.org/10.1016/j.envpol.2009.05.026, 2009. Cabidoche, Y.-M., Achard, R., Cattan, P., Clermont-Dauphin, C., Massat, F., and Sansoulet, J.: Long-term pollution by chlordecone of tropical volcanic soils in the French West Indies: A simple leaching model accounts for current residue, Environ. Pollut. Spec. Issue Sect. Ozone Mediterr. Ecol. Plants People Probl., 157, 1697–1705, 2009. Cannon, S. B., Veazey, J. M., Jackson, R. S., Burse, V. W., Hayes, C., Straub, W. E., Landrigan, P. J., and Liddle, J. A.: Epidemic kepone poisoning in chemical workers, Am. J. Epidemiol., 107, 529–537, 1978. Cattan, P., Cabidoche, Y.-M., Lacas, J.-G., and Voltz, M.: Effects of Tillage and mulching on runoff under banana (Musa spp.) on a tropical Andosol, Soil Tillage Res., 86, 38–51, 2006. Cattan, P., Tonneau, J. P., Charlier, J.-B., Ducreux, L., Voltz, M., Bricquet, J.-P., Andrieux, P., Arnaud, L., and Jannoyer, M.: The challenge of knowledge representation to better understand environmental pollution, in Crisis Management of Chronic Pollution: Contaminated Soil and Human Health, CRC Press, Boca Raton, Florida, USA, 2017. Charlier, J.-B., Cattan, P., Moussa, R., and Voltz, M.: Hydrological behaviour and modelling of a volcanic tropical cultivated catchment, Hydrol. Process., 22, 4355–4370, 2008. Charlier, J.-B., Cattan, P., Voltz, M., and Moussa, R.: Transport of a Nematicide in Surface and Groundwaters in a Tropical Volcanic Catchment, J. Environ. Qual., 38, 1031–1041, https://doi.org/10.2134/jeq2008.0355, 2009. Charlier, J.-B., Lachassagne, P., Ladouche, B., Cattan, P., Moussa, R., and Voltz, M.: Structure and hydrogeological functioning of an insular tropical humid andesitic volcanic watershed: A multi-disciplinary experimental approach, J. Hydrol., 398, 155–170, https://doi.org/10.1016/j.jhydrol.2010.10.006, 2011. Charlier, J.-B., Arnaud, L., Ducreux, L., Ladouche, B., Dewandel, B., Plet, J., Lesueur-Jannoyer, M., and Cattan, P.: Caractérisation de la contamination par la chlordécone des eaux et des sols des bassins versants pilotes guadeloupéen et martiniquais, rapport du projet CHLOR-EAU-SOL, ONEMA, BRGM, CIRAD, Petit-Bourg, Guadeloupe, 2015. Clostre, F., Cattan, P., Gaude, J.-M., Carles, C., Letourmy, P., and Lesueur-Jannoyer, M.: Comparative fate of an organochlorine, chlordecone, and a related compound, chlordecone-5b-hydro, in soils and plants, Sci. Total Environ., 532, 292–300, https://doi.org/10.1016/j.scitotenv.2015.06.026, 2015. Coat, S., Monti, D., Legendre, P., Bouchon, C., Massat, F., and Lepoint, G.: Organochlorine pollution in tropical rivers (Guadeloupe): Role of ecological factors in food web bioaccumulation, Environ. Pollut., 159, 1692–1701, https://doi.org/10.1016/j.envpol.2011.02.036, 2011. Colmet-Daage, F., Lagache, P., de Crécy, J., Gautheyrou, J., Gautheyrou, M., and de Lannoy, M.: Caractéristiques de quelques groupes de sols dérivés de roches volcaniques aux Antilles françaises, Cah. ORSTOMSérie Pédologie III, 3, 91–121, 1965. Cordier, S., Muckle, G., Kadhel, P., Rouget, F., Costet, N., Dallaire, R., Boucher, O., and Multigner, L.: Chlordecone Impact on Pregnancy and Child Development in French West Indies, Crisis Management of Chronic Pollution: Contaminated Soil and Human Health, CRC Press, Boca Raton, Florida, USA, 2017. Crabit, A., Cattan, P., Colin, F., and Voltz, M.: Soil and river contamination patterns of chlordecone in a tropical volcanic catchment in the French West Indies (Guadeloupe), Environ. Pollut., 212, 615–626, https://doi.org/10.1016/j.envpol.2016.02.055, 2016. Della Rossa, P., Jannoyer, M., Mottes, C., Plet, J., Bazizi, A., Arnaud, L., Jestin, A., Woignier, T., Gaude, J.-M., and Cattan, P.: Linking current river pollution to historical pesticide use: Insights for territorial management?, Sci. Total Environ., 574, 1232–1242, https://doi.org/10.1016/j.scitotenv.2016.07.065, 2017. Desprats, J.-F., Comte, J.-P., and Chabrier, C.: Cartographie du risque de pollution des sols de Martinique par les organochlorés, BRGM/RP-53262-FR report, Fort de France, Martinique, 23 pp., 2004. Devault, D. A., Laplanche, C., Pascaline, H., Bristeau, S., Mouvet, C., and Macarie, H.: Natural transformation of chlordecone into 5b-hydrochlordecone in French West Indies soils: statistical evidence for investigating long-term persistence of organic pollutants, Environ. Sci. Pollut. Res., 23, 81–97, https://doi.org/10.1007/s11356-015-4865-0, 2016. Dolfing, J., Novak, I., Archelas, A., and Macarie, H.: Gibbs Free Energy of Formation of Chlordecone and Potential Degradation Products: Implications for Remediation Strategies and Environmental Fate, Environ. Sci. Technol., 46, 8131–8139, https://doi.org/10.1021/es301165p, 2012. European Union: Council Directive 98/83/EC of 3 November 1998 on the quality of water intended for human consumption, Brussels, 1998. European Union: Directive 2000/60/EC of the European Parliament and of the Council of 23 October 2000 establishing a framework for Community action in the field of water policy, Luxembourg, 2000. Farlin, J., Bayerle, M., Pittois, D., and Gallé, T.: Estimating Pesticide Attenuation From Water Dating and the Ratio of Metabolite to Parent Compound, Groundwater, 55, 550–557, https://doi.org/10.1111/gwat.12499, 2017. Fernández-Bayo, J. D., Saison, C., Voltz, M., Disko, U., Hofmann, D., and Berns, A. E.: Chlordecone fate and mineralisation in a tropical soil (andosol) microcosm under aerobic conditions, Sci. Total Environ., 463–464, 395–403, https://doi.org/10.1016/j.scitotenv.2013.06.044, 2013. French government: Décret no. 2001–1220 du 20 décembre 2001 relatif aux eaux destinées à la consommation humaine, à l'exclusion des eaux minérales naturelles, 2001. Gassmann, M., Stamm, C., Olsson, O., Lange, J., Kümmerer, K., and Weiler, M.: Model-based estimation of pesticides and transformation products and their export pathways in a headwater catchment, Hydrol. Earth Syst. Sci., 17, 5213–5228, https://doi.org/10.5194/hess-17-5213-2013, 2013. Germa, A., Quidelleur, X., Labanieh, S., Lahitte, P., and Chauvel, C.: The eruptive history of Morne Jacob volcano (Martinique Island, French West Indies): Geochronology, geomorphology and geochemistry of the earliest volcanism in the recent Lesser Antilles arc, J. Volcanol. Geotherm. Res., 198, 297–310, https://doi.org/10.1016/j.jvolgeores.2010.09.013, 2010. Germa, A., Quidelleur, X., Labanieh, S., Chauvel, C., and Lahitte, P.: The volcanic evolution of Martinique Island: Insights from K–Ar dating into the Lesser Antilles arc migration since the Oligocene, J. Volcanol. Geotherm. Res., 208, 122–135, https://doi.org/10.1016/j.jvolgeores.2011.09.007, 2011. Gilbert, R. O.: Statistical methods for environmental pollution monitoring, Wiley, New York, 1987. Gonzalez, M., Miglioranza, K. B., Shimabukuro, V., Quiroz Londoño, O., Martinez, D., Aizpún, J., and Moreno, V.: Surface and groundwater pollution by organochlorine compounds in a typical soybean system from the south Pampa, Argentina, Environ. Earth Sci., 65, 481–491, https://doi.org/10.1007/s12665-011-1328-x, 2012. Gourcy, L., Baran, N., and Vittecoq, B.: Improving the knowledge of pesticide and nitrate transfer processes using age-dating tools (CFC, SF6, 3H) in a volcanic island (Martinique, French West Indies), J. Contam. Hydrol., 108, 107–117, https://doi.org/10.1016/j.jconhyd.2009.06.004, 2009. IUSS Working Group WRB: World reference base for soil resources 2014 – International soil classification system for naming soils and creating legends for soil maps, FAO, Rome, 2014. Kolpin, D. W., Schnoebelen, D. J., and Thurman, E. M.: Degradates provide insight to spatial and temporal trends of herbicides in ground water, Ground Water, 42, 601–608, 2004. Lachassagne, P., Aunay, B., Frissant, N., Guilbert, M., and Malard, A.: High-resolution conceptual hydrogeological model of complex basaltic volcanic islands: a Mayotte, Comoros, case study, Terra Nova, 26, 307–321, https://doi.org/10.1111/ter.12102, 2014. Lapworth, D. J., Gooddy, D. C., Stuart, M. E., Chilton, P. J., Cachandt, G., Knapp, M., and Bishop, S.: Pesticides in groundwater: some observations on temporal and spatial trends, Water Environ. J., 20, 55–64, https://doi.org/10.1111/j.1747-6593.2005.00007.x, 2006. Lesueur Jannoyer, M., Cattan, P., Woignier, T., and Clostre, F. (Eds. ): Crisis management of chronic pollution: contaminated soil and human health, CRC Press, Boca Raton, 2017. Levillain, J., Cattan, P., Colin, F., Voltz, M., and Cabidoche, Y.-M.: Analysis of environmental and farming factors of soil contamination by a persistent organic pollutant, chlordecone, in a banana production area of French West Indies, Agric. Ecosyst. Environ., 159, 123–132, https://doi.org/10.1016/j.agee.2012.07.005, 2012. Luellen, D. R., Vadas, G. G., and Unger, M. A.: Kepone in James River fish: 1976–2002, Sci. Total Environ., 358, 286–297, https://doi.org/10.1016/j.scitotenv.2005.08.046, 2006. Małoszewski, P. and Zuber, A.: Determining the turnover time of groundwater systems with the aid of environmental tracers, J. Hydrol., 57, 207–231, https://doi.org/10.1016/0022-1694(82)90147-0, 1982. Masih, A., Lal, J. K., and Patel, D.: Contamination and Exposure Profiles of Persistent Organic Pollutants (PAHs and OCPs) in Groundwater at a Terai Belt of North India, Water Qual. Expo. Health, 6, 187–198, https://doi.org/10.1007/s12403-014-0126-6, 2014. Montuori, P., Cirillo, T., Fasano, E., Nardone, A., Esposito, F., and Triassi, M.: Spatial distribution and partitioning of polychlorinated biphenyl and organochlorine pesticide in water and sediment from Sarno River and Estuary, Southern Italy, Env. Sci. Pollut. Res., 21, 5023–5035, https://doi.org/10.1007/s11356-013-2419-x, 2014. Morgenstern, U., Daughney, C. J., Leonard, G., Gordon, D., Donath, F. M., and Reeves, R.: Using groundwater age and hydrochemistry to understand sources and dynamics of nutrient contamination through the catchment into Lake Rotorua, New Zealand, Hydrol. Earth Syst. Sci., 19, 803–822, https://doi.org/10.5194/hess-19-803-2015, 2015. Mottes, C., Lesueur-Jannoyer, M., Charlier, J.-B., Carles, C., Guéné, M., Le Bail, M., and Malézieux, E.: Hydrological and pesticide transfer modeling in a tropical volcanic watershed with the WATPPASS model, J. Hydrol., 529, 909–927, https://doi.org/10.1016/j.jhydrol.2015.09.007, 2015. Mouvet, C., Dictor, M.-C., Bristeau, S., Breeze, D., and Mercier, A.: Remediation by chemical reduction in laboratory mesocosms of three chlordecone-contaminated tropical soils, Environ. Sci. Pollut. Res., 24, 25500–25512, https://doi.org/10.1007/s11356-016-7582-4, 2017. Multigner, L., Kadhel, P., Rouget, F., Blanchet, P. and Cordier, S.: Chlordecone exposure and adverse effects in French West Indies populations, Environ. Sci. Pollut. R., 23, 3–8, https://doi.org/10.1007/s11356-015-4621-5, 2016. Observatoire de l'Eau de la Martinique, Office de L'Eau de la Martinique and Asconit Consultants: Détermination de la contamination des milieux aquatiques par le chlordécone – VOLET 4? : Investigations complémentaires – Renforcement du maillage géographique sur les cours d'eau d'intérêt piscicole, 2012. Orndorff, S. A. and Colwell, R. R.: Microbial transformation of Kepone, Appl. Environ. Microbiol., 39, 398–406, 1980. Quantin, P., Balesdent, J., Bouleau, A., Delaune, M., and Feller, C.: Premiers stades d'altération de ponces volcaniques en climat tropical humide (montagne pelée, martinique), Geoderma, 50, 125–148, https://doi.org/10.1016/0016-7061(91)90030-w, 1991. Ryberg, K. R. and Gilliom, R. J.: Trends in pesticide concentrations and use for major rivers of the United States, Sci. Total Environ., 538, 431–444, https://doi.org/10.1016/j.scitotenv.2015.06.095, 2015. SAS Institute Inc: SAS/STAT Software: Release 9.3, SAS Institute Inc., Cary, North Carolina, 2002. Stone, W. W., Gilliom, R. J., and Ryberg, K. R.: Pesticides in U.S. Streams and Rivers: Occurrence and Trends during 1992–2011, Environ. Sci. Technol., 48, 11025–11030, https://doi.org/10.1021/es5025367, 2014. Tesoriero, A. J., Saad, D. A., Burow, K. R., Frick, E. A., Puckett, L. J., and Barbash, J. E.: Linking ground-water age and chemistry data along flow paths: Implications for trends and transformations of nitrate and pesticides, J. Contam. Hydrol., 94, 139–155, https://doi.org/10.1016/j.jconhyd.2007.05.007, 2007. UNEP: Report of the Persistent Organic Pollutants Review Committee on the work of its third meeting, Addendum, Risk management evaluation on chlordecone, Geneva, Switzerland, 2007. US Environmental Protection Agency: Estimation Programs Interface Suite™ for Microsoft® Windows, Washington, DC, USA, 2012. Vittecoq, B., Reninger, P. A., Violette, S., Martelet, G., Dewandel, B., and Audru, J. C.: Heterogeneity of hydrodynamic properties and groundwater circulation of a coastal andesitic volcanic aquifer controlled by tectonic induced faults and rock fracturing – Martinique island (Lesser Antilles – FWI), J. Hydrol., 529, 1041–1059, https://doi.org/10.1016/j.jhydrol.2015.09.022, 2015. Wilson, N. K. and Zehr, R. D.: Structures of some Kepone photoproducts and related chlorinated pentacyclodecanes by carbon-13 and proton nuclear magnetic resonance, J. Org. Chem., 44, 1278–1282, https://doi.org/10.1021/jo01322a020, 1979. Woignier, T., Clostre, F., Macarie, H., and Jannoyer, M.: Chlordecone retention in the fractal structure of volcanic clay, J. Hazard. Mater., 241–242, 224–230, https://doi.org/10.1016/j.jhazmat.2012.09.034, 2012. Zhang, Z., Huang, J., Yu, G., and Hong, H.: Occurrence of PAHs, PCBs and organochlorine pesticides in the Tonghui River of Beijing, China, Environ. Pollut., 130, 249–261, https://doi.org/10.1016/j.envpol.2003.12.002, 2004.